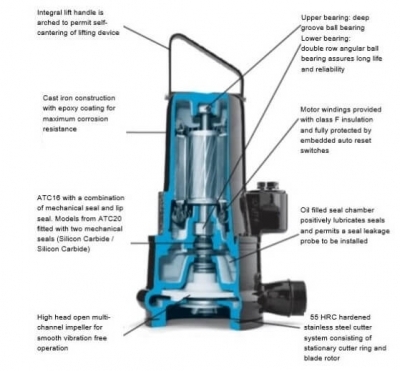 The ATC submersible macerating pump is designed to handle sewage and waste water, with flows up to 7l/s and heads of 50 metres. It is ideal for small domestic and commercial Installations and remote small developments, such as farms and motorway service stations where the pumping main can have very long pipe runs. External three blade hardened stainless steel cutter blade, rotates in front of a perforated cutter plate which shears any solid present before entering the casing and vortex impeller. Cast iron pump, vortex impeller, stainless steel shaft, rotary shaft seals between pump, oil chamber, and an IP68 electric motor.